Despite the rush of December excitement, we are still working hard on our Alphabet letters. 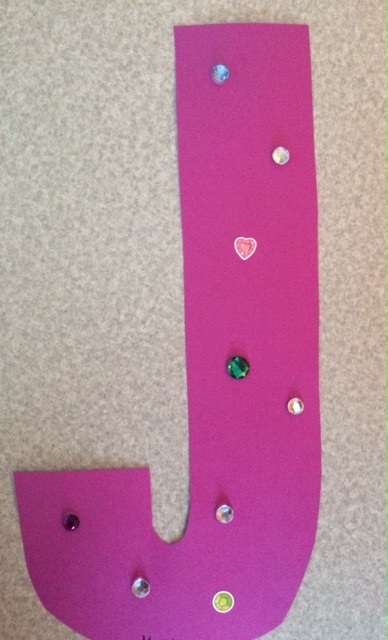 Our letter of the week is “J” and we created our sparkling “j jewel.” We will send home the J printing and jewels next week; ‘K” will be the last letter we will work on before the holidays. Our last story for our mini “Bears in Literature” theme was “Goldilocks and the Three Bears.” It was very heartwarming to see and hear so much familiarity with this beloved Fairy Tale. Fairy Tales are an important genre in a child’s literary background. There are many references to Fairy Tales and Fairy Tale characters in other books, including idioms and parodies. The children need a solid knowledge base of these very special stories to help them understand literary patterns; to make connections between new text they are reading with Fairy Tale references; and literary archetypes. We will be teaching a big literature unit on Fairy Tales in the spring; but in the meantime, we encourage you to pull out your childhood Fairy Tale books to share with your child. We had two Christmas Concert Rehearsals this week and we are definitely looking very cute in our Christmas crowns. Many thanks to our mom helpers for coming in to make and size the crowns for us. 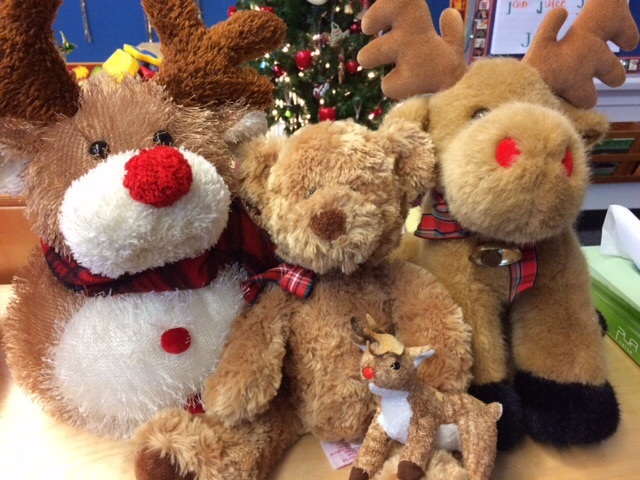 Please remember this is the last weekend to help your child organise their “Christmas Best” clothing to wear on Tuesday (dress rehearsal and school performance for students only) and Wednesday (morning show, afternoon show) next week. The children will come to school in their fancy clothes both days and we will work hard to keep them clean for two days. Please pack “neat” food for both days – no spaghetti sauce, soups or anything that falls easily off a fork or spoon. Our classrooms are almost decorated for the holidays. Christmas trees are lighted and adorned, the Advent calendar is filled with sweet treats and Christmas stuffed animals are out and around the room. But Christmas isn’t Christmas without lots of handmade craft projects. So this week we got out our felt pens and Christmas stickers to make these beautiful Angel and Christmas hangers. The children will bring theirs home for the holidays. We got to see our Buddies twice this week because we had to get started on a very special Christmas craft. We’re using pins, sequins and marshmallows…can you guess? Our Buddies also helped us to trace our feet and hands to make some baby reindeer. 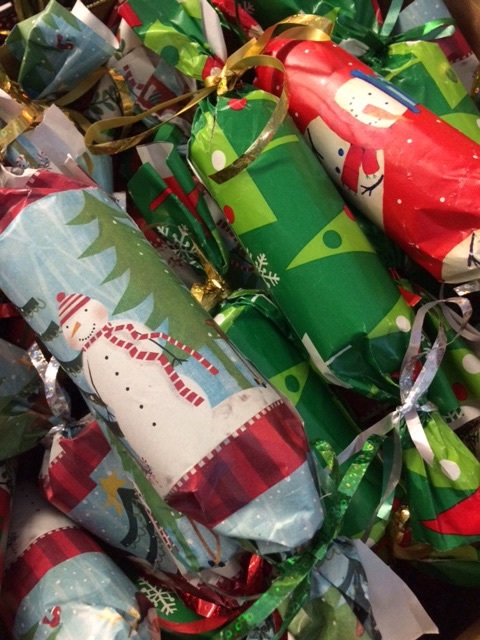 Our annual tradition of making Christmas Crackers with your generous donations of Hallowe’en candy was a huge success! We got together with our Grade 7 Buddies and made many beautiful crackers. 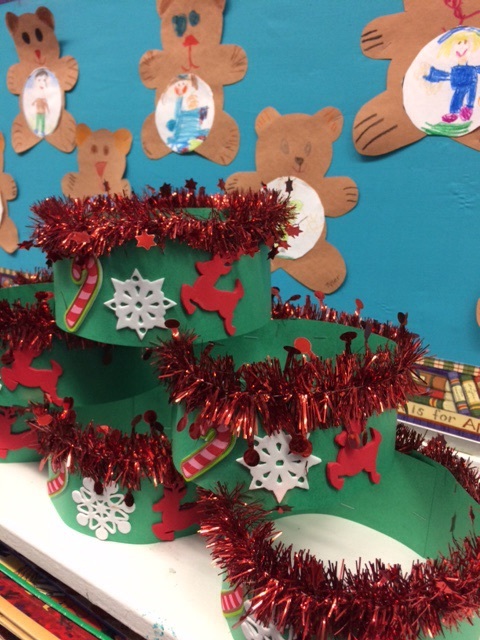 The children worked hard to stuff the paper rolls with candy and wrapped them with festive paper and ribbons. Monday, December 5 is a Professional Day. Students are not in session. Tuesday, December 6 is a Dress Rehearsal and School Performance for students only. Students must wear their “Christmas Best” clothing. Crowns will remain at school. Wednesday, December 7 is our Christmas Concert with two shows. If your child is in Mrs. Campbell’s and Mrs. Zambon’s class, parents will attend the 11am concert. If your child is in Mrs. Daudlin’s class parents will attend the 1:10pm show. The children will be performing in both shows but parents are invited for only one. Thursday, December 8….we rest…and play. Friday, December 9, first term report cards will be distributed. If your child will be away on holidays and not at school their report will be given to them when we return to school in January. Gingerbread House Making Family event. Ridgeview’s Me to We Team’s Annual Gingerbread House Night will take place on Tuesday, December 13th from 6:00 – 7:00 pm, in the Ridgeview Gym! Each house kit (which includes some icing and candy) costs $10.00. Extra icing can be purchased for $1.00 and extra candy for $2.00. All profits go to the Me to We team’s efforts to support education in a developing country. Please purchase your house and extra supplies on our new School Cash Online purchasing site. Supplies are limited, so order soon! Ordering will close next Friday, December 9th.